NASA has just released the first full frame images of Vesta– and they are thrilling! The new images unveil Vesta as a real world with extraordinarily varied surface details and in crispy clear high resolution for the first time in human history. The newly published image (shown above) was taken at a distance of 3,200 miles (5,200 kilometers) by Dawn’s framing camera as the probe continues spiraling down to her initial science survey orbit of some 1,700 miles (2,700 km) altitude. The new images show the entire globe all the way since the giant asteroid turns on its axis once every five hours and 20 minutes. Vesta and its new moon – Dawn – are approximately 114 million miles (184 million kilometers) distant away from Earth. Dawn was launched atop a Delta II Heavy booster rocket in September 2007, took a gravity assist as it flew past Mars and has been thrusting with exotic ion propulsion for about 70 percent of the time ever since. Dawn will spend 1 year collecting science data in orbit around Vesta before heading off to the Dwarf Planet Ceres. The science team has just completed their press briefing. Watch for my more detailed report upcoming soon. And don’t forget JUNO launches on Aug 5 – It’s an exciting week for NASA Space Science and I’ll be reporting on the Jupiter orbiter’s blastoff and more – as Opportunity closes in on Spirit Point ! NASA’s groundbreaking interplanetary science is all inter connected – because Vesta and Ceres failed to form into full-fledged planets thanks to the disruptive influence of Jupiter. NASA’s Dawn Asteroid Orbiter is now spiraling down ever closer to the protoplanet Vesta – since arriving on July 16 – and capturing magnificent new high resolution images of the huge impact basin at the South Pole that dominates the surface. See enhanced image here. The Dawn team just released a new image taken by the framing camera on July 18 as the orbiter flew from the day side to the night side at an altitude of 10,500 kilometers above Vesta, the second most massive body in the main Asteroid Belt between Mars and Jupiter. “I find this picture very dramatic !” exclaimed Dr. Marc Rayman, Dawn Chief Engineer from the NASA’s Jet Propulsion Laboratory in Pasadena, Calif., in an interview with Universe Today. “After having this view, the spacecraft resumed gradually spiraling around its new home, heading for survey orbit where it will begin intensive observations of Vesta,” Rayman told me. 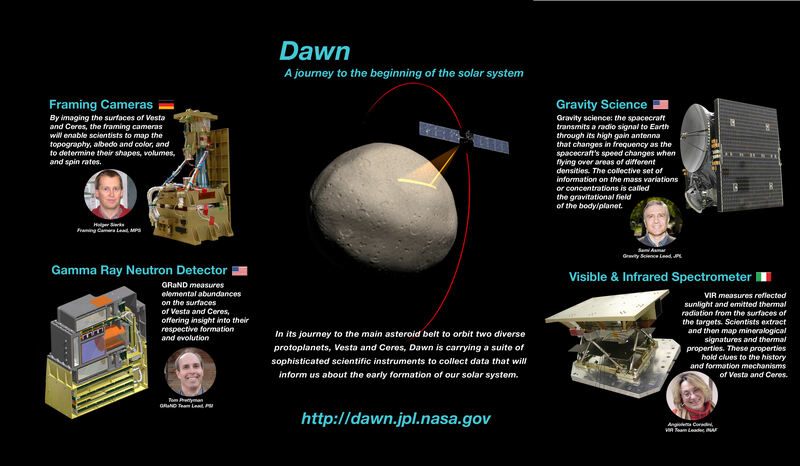 Dawn will reach the initial science survey orbit in early August, approximately 1700 miles above the battered surface. Vesta turns on its axis once very five hours and 20 minutes. Vesta suffered an enormous cosmic collision eons ago that apparently created a gigantic impact basin in the southern hemisphere and blasted enormous quantities of soil, rocks and dust into space. Some 5% of all meteorites found on Earth originate from Vesta. “The south pole region was declared to be a large impact basin after the Hubble Space Telescope (HST) data and images were obtained,” elaborated Prof. Chris Russell, Dawn Principal Investigator from UCLA. “Now that we have higher resolution images we see that this region is unlike any other large impact on a small body but much of our experience here is on icy bodies of similar size,” Russell told me. Dawn’s new images of Vesta taken at close range from just a few thousand miles away, now vastly exceed those taken by Hubble as it circled in Earth orbit hundreds of millions of miles away and may cause the science team to reevaluate some long held theories. “The team is looking forward to obtaining higher resolution data over this region to look for confirmatory evidence for the impact hypothesis. They are not yet willing to vote for or against the HST interpretation. Needless to say the team got very excited by this image,” said Russell. Dawn will orbit Vesta for one year before heading to its final destination, the Dwarf Planet Ceres. NASA’s super exciting Dawn mission to the Asteroid Belt marked a major milestone in human history by becoming the first ever spacecraft from Planet Earth to achieve orbit around a Protoplanet – Vesta – on July 16. Dawn was launched in September 2007 and was 117 million miles (188 million km) distant from Earth as it was captured by Asteroid Vesta. Dawn’s achievements thus far have already exceeded the wildest expectations of the science and engineering teams, and the adventure has only just begun ! – so say Dawn’s Science Principal Investigator Prof. Chris Russell, Chief Engineer Dr. Marc Rayman (think Scotty !) and NASA’s Planetary Science Director Jim Green in exclusive new interviews with Universe Today. As you read these words, Dawn is steadily unveiling new Vesta vistas never before seen by a human being – and in ever higher resolution. And it’s only made possible via the revolutionary and exotic ion propulsion thrusters propelling Dawn through space (think Star Trek !). That’s what NASA, science and space exploration are all about. Dawn entered orbit at about 9900 miles (16000 km) altitude after a nearly 4 year journey of 1.73 billion miles. Over the next few weeks, the spacecrafts primary task is to gradually spiral down to its initial science operations orbit, approximately 1700 miles above the pock marked surface. Vesta is the second most massive object in the main Asteroid Belt between Mars and Jupiter. Dawn is the first probe to orbit an object in the Asteroid Belt. I asked Principal Investigator Chris Russell from UCLA for a status update on Dawn and to describe what the team can conclude from the images and data collected thus far. “The Dawn team is really, really excited right now,” Russell replied. Russell praised the team and described how well the spacecraft was operating. “The flight team has been great on this project and deserves a lot of credit for getting us to Vesta EARLY and giving us much more observation time than we had planned,” Russell told me. Dawn will remain in orbit at Vesta for one year. Then it will fire its ion thrusters and head for the Dwarf Planet Ceres – the largest object in the Asteroid Belt. Dawn will then achieve another major milestone and become the first spacecraft ever to orbit two celestial objects. “Getting Dawn into orbit is an amazing achievement,” Green told me. Sharper new images from Vesta will be published by NASA in the next day or so. However, since Dawn is now orbiting Vesta our upcoming view of the protoplanet will be quite different from what we’ve seen in the approach images thus far. “We will be changing views in the future as the spacecraft begins to climb into its science orbit,” stated Russell. Dawn is an international mission with significant participation from Germany and Italy. The navigation images were taken by Dawn’s framing cameras which were built in Germany. Exploring Vesta is like studying a fossil from the distant past that will immeasurably increase our knowledge of the beginnings of our solar system and how it evolved over time. Vesta suffered a cosmic collision at the south pole in the distant past that Dawn can now study at close range. That intriguing peak is now obvious in the latest Dawn images from Vesta. But what does it mean and reveal ? “We wonder what is that peak? replied Green. “Is it part of the core exposed? “The Dawn team hopes to answer these questions. I can’t wait!” Green told me. As a result of that ancient south pole collision, about 5% of all the meteorites found on Earth actually originate from Vesta. Keep your eyes glued to Dawn as mysterious Vesta’s alluring secrets are unveiled. The excitement is building as NASA’s innovative Dawn spacecraft closes in on its first protoplanetary target, the giant asteroid Vesta, with its camera eyes now wide open. The probe is on target to become the first spacecraft from Earth to orbit a body in the main asteroid belt and is set to arrive about four months from now in late July 2011. Vesta is the second most massive object in the Asteroid Belt between Mars and Jupiter (map below). Since it is also one of the oldest bodies in our Solar System, scientists are eager to study it and search for clues about the formation and early history of the solar system. Dawn will spend about a year orbiting Vesta. Then it will fire its revolutionay ion thrusters and depart for Ceres, the largest asteroid in our solar system. Dawn is equipped with three science instruments to photograph and investigate the surface mineralogy and elemental composition of the asteroid. The instruments were provided by the US, Germany and Italy. The spacecraft has just awoken from a six month hibernation phase. All three science instruments have been powered up and reactivated. Dawn will image about 80 percent of Vesta’s surface at muliple angles with the onboard framing cameras to generate topographical maps. During the year in orbit, the probe will adjust its orbit and map the protoplanet at three different and decreasing altitudes between 650 and 200 kilometers, and thus increasing resolution. The cameras were provided and funded by Germany. To prepare for the imaging campaign, mission planners from the US and Germany conducted a practice exercise to simulate the mission as though they were mapping Vesta. The effort was coordinated among the science and engineering teams at NASA’s Jet Propulsion Laboratory, the Institute of Planetary Research of the German Aerospace Center (DLR) in Berlin and the Planetary Science Institute in Tuscon, Ariz.
Two teams worked independently and used different techniques to derive the topographical maps from the available data sets. The final results showed only minor differences in spatial resolution and height accuracy. Using the best available observations from the Hubble Space Telescope and ground based telescopes and computer modeling techniques, they created maps of still images and a rotating animation (below) showing their best guess as to what Vesta’s surface actually looks like. The maps include dimples, bulges and craters based on the accumulated data to simulate topography and thus give a sense of Virtual Vesta in three dimensions (3 D). Of course no one will know how close these educated guesses come to matching reality until Dawn arrives at Vesta. The framing camera system consists of two identical cameras developed and built by the Max Planck Institute for Solar System Research, Katlenburg-Lindau, Germany and the German Aerospace Center (DLR) in Berlin. “The camera system is working flawlessly. The dry run was a complete success,” said Andreas Nathues, lead investigator for the framing camera at the Max Planck Institute in Katlenburg-Lindau, Germany. Since the probe came out of hibernation, the mechanical and electrical components were checked out in mid March and found to be in excellent health and the software was updated. Dawn is a mission of many firsts. Dawn spacecraft under construction in Cleanroom. The spacecraft is NASA’s first mission specifically to the Asteroid Belt. It will become the first mission to orbit two solar system bodies. The revolutionary Dawn mission is powered by exotic ion propulsion which is vastly more efficient than chemical propulsion thrusters. Indeed the ability to orbit two bodies in one mission is only enabled via the use of the ion engines fueled by xenon gas. Vesta and Ceres are very different worlds that orbit between Mars and Jupiter. Vesta is rocky and may have undergone volcanism whereas Ceres is icy and may even harbor a subsurface ocean conducive to life. Dawn will be able to comparatively investigate both celestial bodies with the same set of science instruments and try to unlock the mysteries of the beginnings of our solar system and why they are so different. Dawn is part of NASA’s Discovery program and was launched in September 2007 by a Delta II rocket from Cape Canaveral Air Force Station, Florida. Virtual Vesta in 2 D.
Virtual Vesta in 3 D.